When it comes to any task, as the saying goes ‘preparation is key’ and this is never truer than when undertaking heritage digitisation projects. Although it can increase the lead time of a project, carrying out pre-digitisation checks and thoroughly preparing materials prior to digitising them is vital in producing the best image results. And, more importantly, insufficiently preparing items can actually put them at risk of sustaining damage during the digitisation process. Of course every digitisation project is different – therefore the scale of preparation should be too. The British Library Collections Care blog states that, although planning is vital to ensure the success of a project, levels of preparation needed depend on the purpose of the project and intended end use of the images. In our experience – balance is best. A balance between preparing collections thoroughly for the digitisation process, but not becoming so pre-occupied with preparation that it delays the project (though clearly a project should not proceed if items are in an unsuitable condition for this). The first step in preparing bound books is to check for robustness and any obvious wear, including brittleness, mould and other damage. If any of these are found to be present on a particular volume, it may be unsuitable for digitisation and need to undergo conservation processes to repair/stabilise it before being scanned. A second aspect to check is the books’ binding. If a book is tightly bound – curvature in the pages can result in skew in the final images and potentially even some text/imagery being lost if this runs into the centre of the book. Although this is unavoidable in some cases, sometimes it may be appropriate to remove the volume’s binding during preparation – in order to digitise it. This allows the pages to be digitised whilst flat, producing better quality final images. Conversely however, books with a damaged/broken binding may often still be digitised safely – either as loose leaves or whole volumes using low-stress support cradles. Thirdly, check through the bound volumes (or a sample of them if a collection is large) for inserts and/or foldouts. These will need to be unfolded and the equipment recalibrated, or possibly the insert (and volume) even moved to a different piece of equipment, to be captured. Identifying these during the preparation stage allows a procedure for dealing with inserts/foldouts to be planned and avoid slowing down the digitisation process. Newspaper archives are ordinarily very fragile in nature due to the inherent brittleness of the material they are printed on. So, as with Bound Volumes above, a first step in preparing them is to check the condition of the newspapers is suitable for digitisation. Secondly because of their fragility, they can crease and fold easily – especially if stored in stacks. Naturally these creases and folds can negatively affect the final digitised images of the newspapers, creating visible distortions. If checked for and identified during the preparation phase of a project, these visible creases can be minimised to some extent by relaxing (lying flat) the affected newspapers for a period of time prior to digitisation. In rare, extreme cases a conservator may be required to carry out conservation processes to mitigate this. For newspaper collections which are bound together in volumes containing many editions, for example a year per volume, please see Books & Bound Volumes section above. 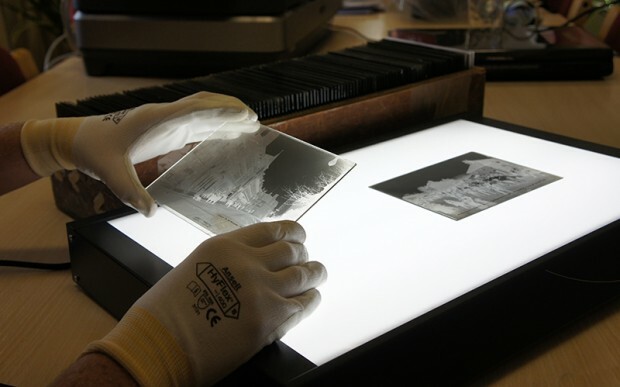 When preparing photographs for digitisation, The National Archives advises handling wearing unpowdered nitrile or latex gloves, as cotton gloves can result in a loss of touch and dexterity – increasing the risk of damage to the photographs. In addition, cotton gloves may produce lint which can distort the final digitised image. Because of their static nature – it is likely that any photos, but particularly older ones, will have become dirty over time. As any dirt might obscure/affect the digitised images, photos should be cleaned with a bulb blower during the preparation phase to remove surface dust particles and minimise this. In addition, grouping together photographs of similar sizes during preparation will help minimise recalibration of equipment during the digitisation and maximise the efficiency of the workflow. With regards to photograph albums it is very much dependent on the type of album as to how they should be prepared. Some albums hold individual photos within sleeves and in this case, if possible, during preparation the photos should be removed from the sleeves to avoid colour distortion and light reflection. Whereas other albums are simply bound sheets of card onto which the photos are affixed. If this is the case, then over time the adhesive used may have failed and any loose material will need to be re-fixed before digitisation can be carried out. Typically there is little preparation that can be performed in terms of 35mm slides. Making sure the frames are secure and straight within their card/plastic mounts is an important first step. Due to the high scanning resolution generally used when digitising 35mm slides, even the smallest particle of dust can show up on the scanned images. As with Photographs, before 35mm slides are digitised, surface dust should be removed using a bulb blower. It is worth noting though that using a bulb blower might not remove all ‘hardy’ dirt from the slides, which may appear on the digitised image. This can be resolved through two potential options: one is to employ a conservator to clean the slides, but this can be a lengthy and costly process; or alternatively specialist post-production software can be used to digitally clean the images after the slides have been scanned. When preparing microfilm and microfiche, generally the same procedures can be applied as when working with 35mm slides – including removal of surface dust with a bulb blower. As always, the overall condition of the plates should be checked before digitisation is considered – and plates with cracks, chips, or peeling/deteriorating emulsion identified. With older plates, where emulsion is deteriorating, dusting/cleaning them during the preparation stage can cause further damage. When preparing to digitise glass plate negatives, cotton or nitrile gloves should be worn at all times, in line with National Archives guidance. In addition to helping protect the plates, wearing gloves also prevents injury from potentially sharp edges. As with other similar media – glass plate negatives should be prepared and cleaned with an air blower to remove any surface dirt and dust, which could affect the clarity of the final digitised images. The National Archives recommend that glass plates are stored in envelopes to help prevent any damage to these fragile materials. It can be tempting to remove all the glass plates from their storage envelopes in advance of digitisation, in order to save time and have them ready to scan. Whilst a good idea in principle, in order to mitigate risk to these fragile items – it is advised that glass plates are removed from storage, prepared, and digitised one batch at a time; in order to limit the time each glass plate is exposed to risk. If you would like to find out more about preparing any of the materials mentioned, you might find our how-to guides on digitising photograph collections, bound books, glass plate negatives, 35mm slides and newspapers useful. Alternatively for specific advice on preparing your collections for digitisation, contact us.